the NBA, Awesomeness TV, Fuse and Airbnb. As for the voices in my head, my award-winning plays have been performed across the country, with published works that include The Gifted Program, Portland and the collection HOLD & Other Short Plays. Lead script writer for  All-Star Weekends and nearly all of the league’s global marquee productions. Over a decade of experience threading sponsor stories into events while maintaining the integrity of the NBA brand, creating a seamless and entertaining game experience. Head Writer for Top 5 Live, a high-concept talk show taking young audiences on an unpredictable journey celebrating five things about a new guest influencer every day live on Go90. Held in Paris at the Parc De Villette, the 2015 Airbnb Open was one of the largest international conferences in history. As the head script writer, I developed keynotes for the founders and executive leadership, as well as all emcee copy for the three-day event. My input spanned from award show and video introductions to developing a theatrically-inspired performance keynote in 48 hours. Guest-writer for the weekly music countdown show Fuse: Top 20, and head writer for several of the network’s top-rated specials including, The 100 Sexiest Videos of All-Time, Fuse News Presents: Justin Bieber and Top 25: One-Hit Heroes. Can you write a production-ready TV Pilot in three days? Starting with that urgent request, I was tasked to develop three episodes of a sports-themed show aimed at kids, featuring a throwback 70s host, Superbowl coverage with NFL stars and a guest appearance by Dwight Howard. "Carbajal's humor alternates between lacerating and indulgent, and never slackens." "Perhaps none of us were recluses in the gifted program, but we can all relate to the issues of adolescence that The Gifted Program evokes so well." At Washington High in the year 1985, four of the school’s smartest and least-popular kids struggle day-to-day, finding escape through basement sessions of Dungeons & Dragons. But when a radio request show turns a private crush public, the simple pursuit of an education becomes a fight for survival. ‘…The language is so rich, so deep, and so full of complex emotions that I was in tears by the end. Ed, a young man adrift in life, moves into a small apartment with Li, his ex-lover. Ed's awkward encounters as a room service waiter punctuate the ambiguous intimacy with his roommate, as their murky past and true feelings slowly come clear. A spare meditation on the indivisibility of love and loss. 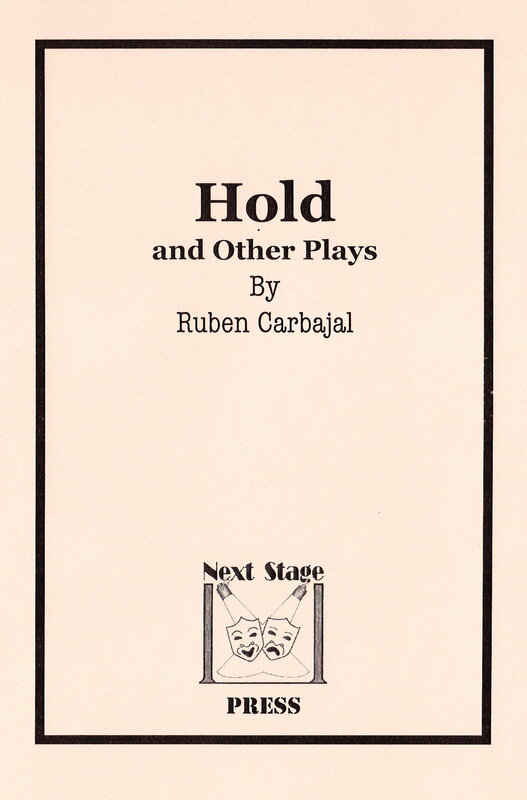 "In just 25 minutes, Ruben Carbajal's HOLD is able to make you laugh and think about your life." Surreal, unflinching and darkly comic, this collection of Ruben Carbajal's award-winning short plays cover everything from the menace of customer service phone calls to visions of a world bereft of books. In between there's an existential horse, New Yorkers confronting death, morally bankrupt (but comically rich) suburbanites, and a man in a flying lawn chair who may be a hero or a lunatic. Have a live event in need of script writer? Trying to find the right voice for your keynote presentation? Need dialogue that's smart and snappy? Want more information on my plays or would like to schedule a public appearance? Feel free to email me at REACH RUBEN AT GMAIL DOT COM (or use the mail button below).